Silahkan klik tulisan atau gambar untuk lanjut membaca Pizza Hut Sliders: Chain Unveils 'Secret' New Dish After Super Bowl. On Sunday night, well over 100 million Americans tuned in to CBS to find the answer to what has been one of the most suspenseful questions in the country for weeks. Who would win the Super Bowl? Nah -- what was the secret new menu item Pizza Hut was planning to unveil during the Super Bowl? 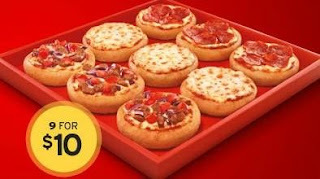 The mini-pizzas measure 3.5" across and are sold in boxes of three for $5 and boxes of nine for $10. They are available at Pizza Huts across the country starting today. The Sliders can be ordered with any of the normal Pizza Hut pizza toppings.